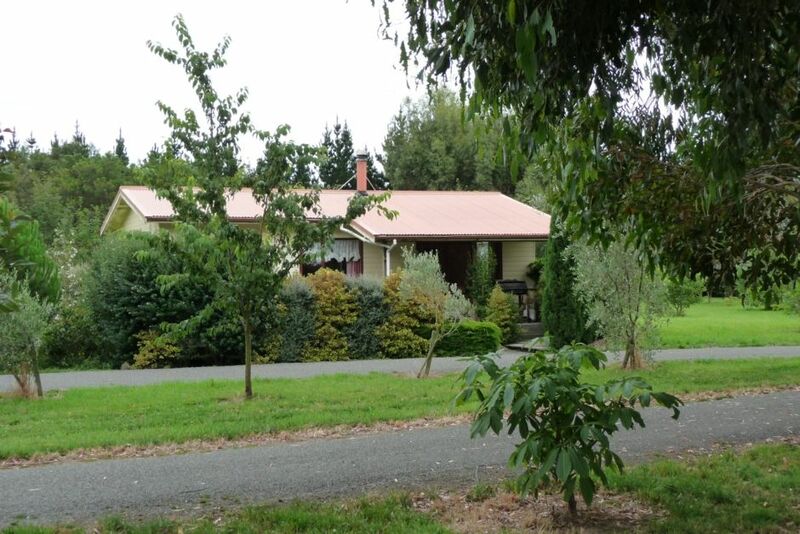 Separate self contained modern holiday cottage in rural South Wairarapa, ideally located in between Martinborough, Greytown and Featherston. The cottage accommodates 4 persons, open plan living, full kitchen facilities, two separate bedrooms, one queen sized bed, two single beds. Children welcome. Heated by woodfire, firewood provided. Parklike setting, 5 Ha (or 12.5 acres) of relaxation, over 100 different varieties of trees, in Wairarapa's wine country, and only 70 Kms from Wellington CBD. Visit the vineyards at Martinborough, the seal colony at Ngawi, Stonehenge at Carterton, walk in the Tararua's or Remutaka's, or just simply enjoy the surroundings, discover the property, sit on a bench, hear and see the birds, have a picnic or read a book. We provide breakfasts for our guests in a friendly family atmosphere in the main dwelling on the property, as we do for our homestay guests as well. A choice of home baked artisan breads, home made yoghurt, cereal, seasonal fresh fruit, coffee/tea, and we do cater for special diets like gluten free, lactose intolerant or any other diet that you may have to follow. Dinners on request, again we can cater for special diets / allergies. Whispering Winds: especially designed and developed to feel good. Wouldn't you want to be there too? Have a picnic without the need of going anywhere. Private settings and park benches all around. 5 Hectares of gardens with lots of trees, birdlife, park like setting in rural area. There is a selection of books in the cottage. Some games for children are available. A selection of CD's is available. Toys for children and cuddly animals are available. 5 Hectares of gardens to walk around. Marianne and Jan give a very warm welcome and a lovely homemade breakfast complete with fermented breads baked in their traditional outdoor oven. Marianne takes time to nurture her guests much like the good old days of bed and breakfast accommodation. The grounds are lovely and the place itself is fairly simple but fine. No mod cons at all which is good if you want to get away from it all. Thank you for a relaxing time and your kindness. Stayed for a week as we explored all the food, bike trails, walks of Wairarapa. This place is brilliantly situated in the quiet countryside between Featherston, Greytown and Martinborough. Friendly, helpful and interesting hosts, with great breakfasts. Lovely lovely setting. Tight Lines Shane & Glenn. Great location for easy drive to Greytown, Featherston and Martinborough, say 10-12 mins to each. Great location for easy drive to Greytown, Featherston and Martinborough, say 10-12 mins to each. Our group stayed in the cottage and a couple of rooms in the house. Very comfortable, firm bed so which I like. Great to have our own space while coming in for a tasty and healthy continentla breakfast in the morning. Only downside was no internet, and there is no tv. however the cat and the sweeping grounds were great distractors. The grounds are amazing. Would definitely stay again!